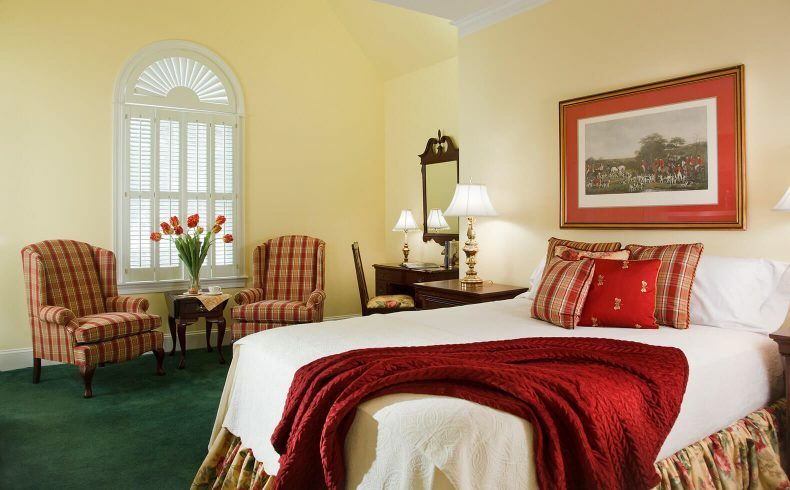 Our West Chester, PA lodging options are situated over 13 lovely landscaped acres of the Brandywine Valley. 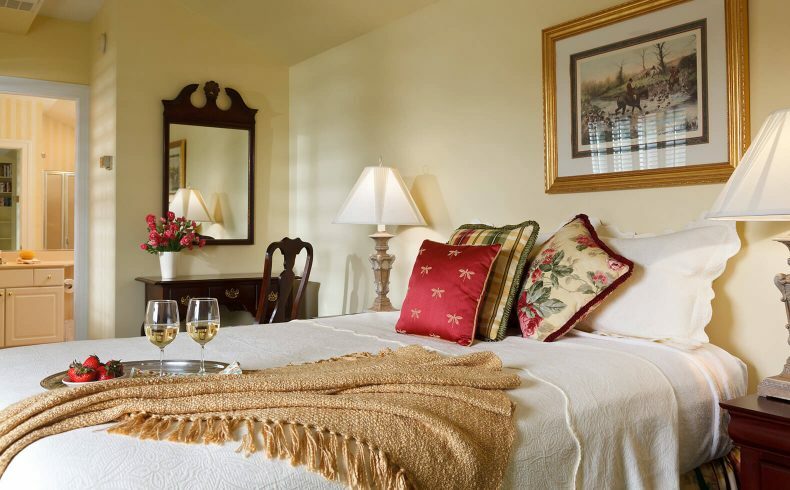 All separate from the main house our guest rooms and suites are designed for comfort and luxury. 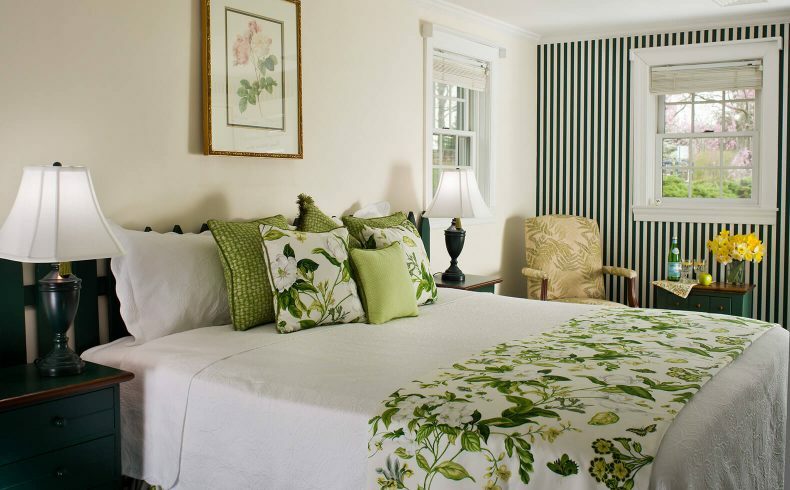 Decorated with a Hunt Country elegance and modern amenities, these rooms will make your Brandywine Valley getaway one to remember. View our policies and accessibility features. 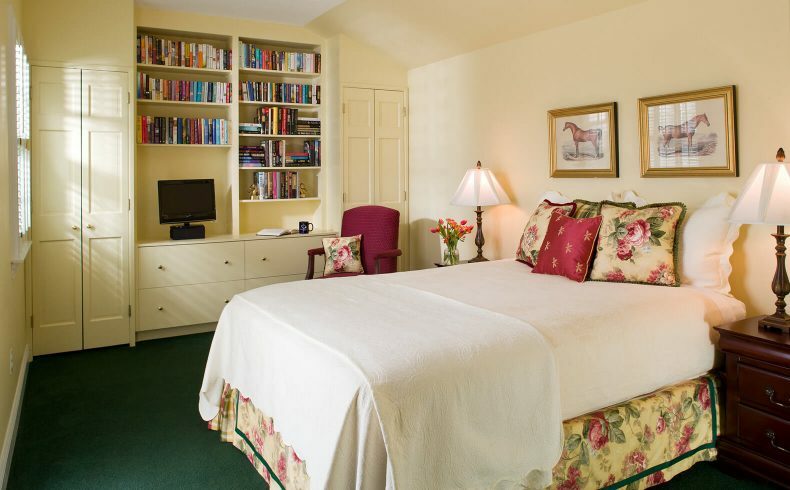 A quaint equestrian style room with a charming queen bed. A charming room with country elegance. 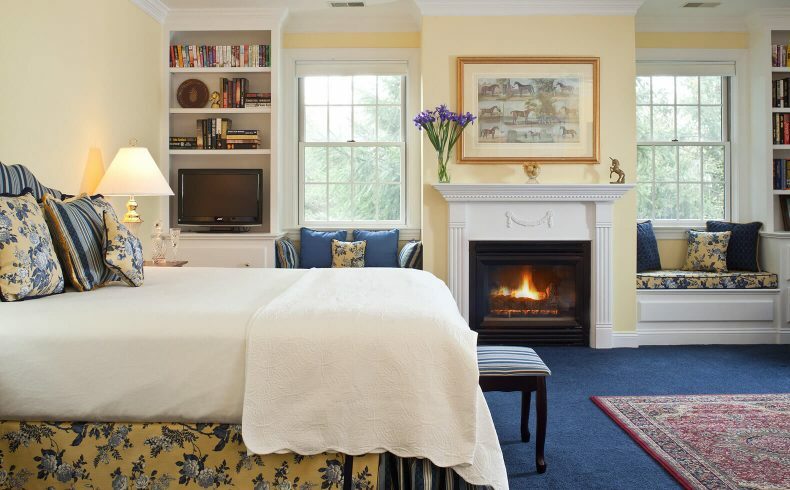 A Carriage House room that exudes country elegance. 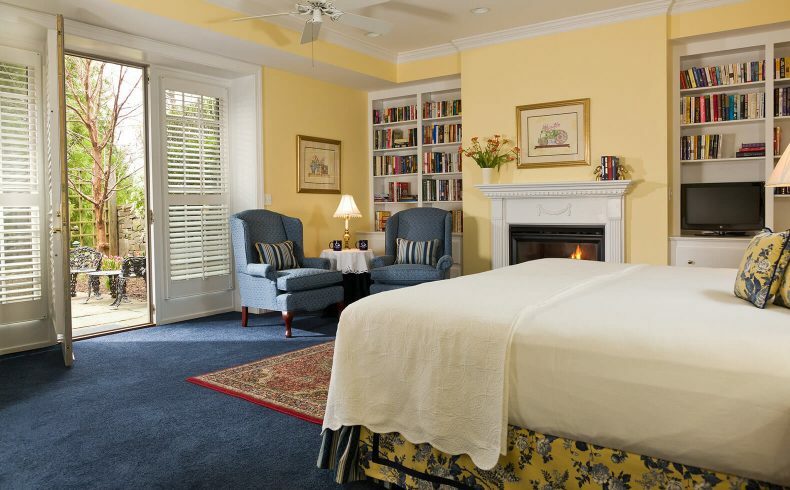 A charming room with a king bed or two twin beds. 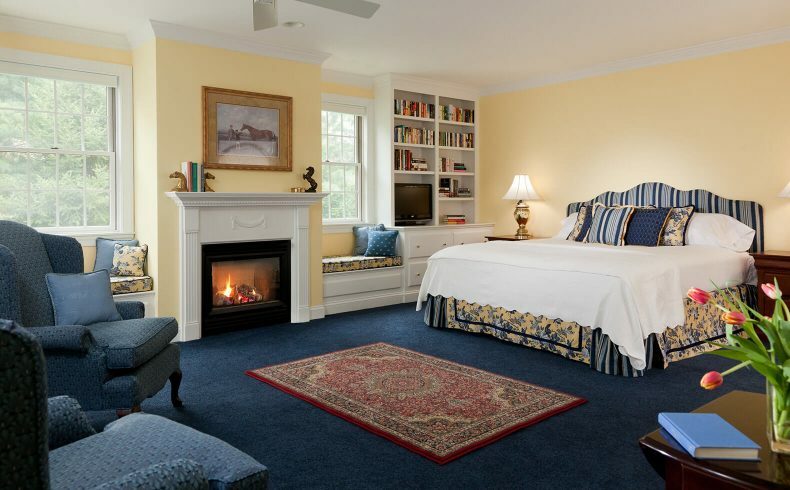 A cozy queen room in the Carriage House. The perfect room for ultimate serenity. A perfect room for comfort and relaxation. A beautifully appointed room in the Saddle Barn. 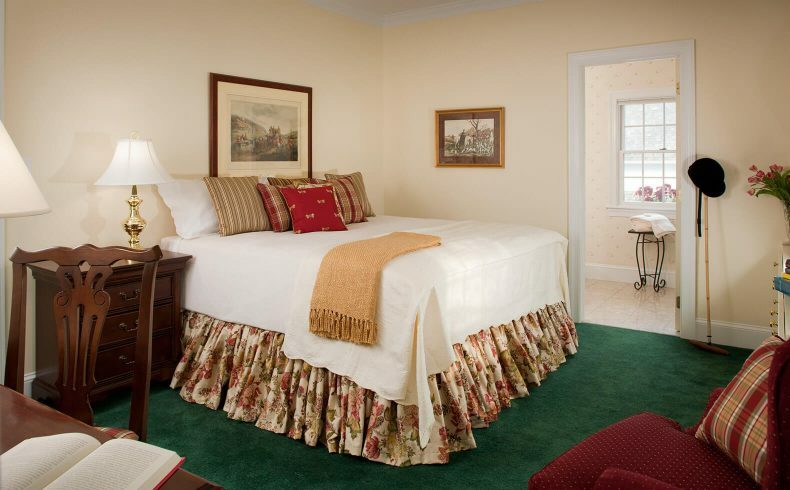 A beautiful room that features country elegance. A romantic room with English country sophistication. 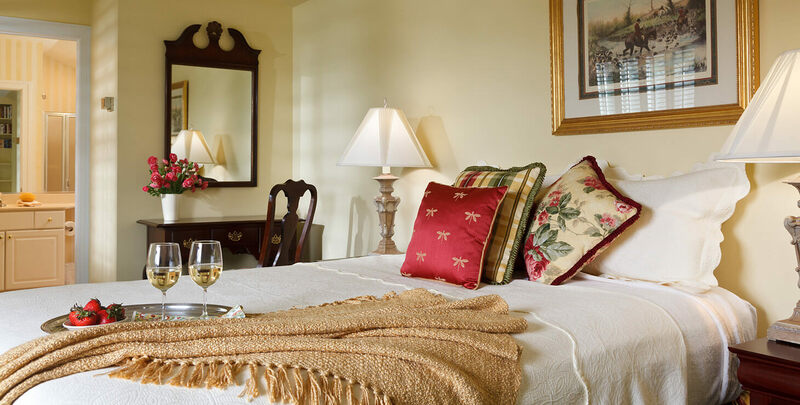 In order to make your stay at Inn at Whitewing Farm as comfortable and luxurious as possible, all of our Rooms and Suites feature the following fine amenities. Check-in: 3:00pm-6:00pm Please let us know if a late arrival time is needed, we will help make arrangements for you. 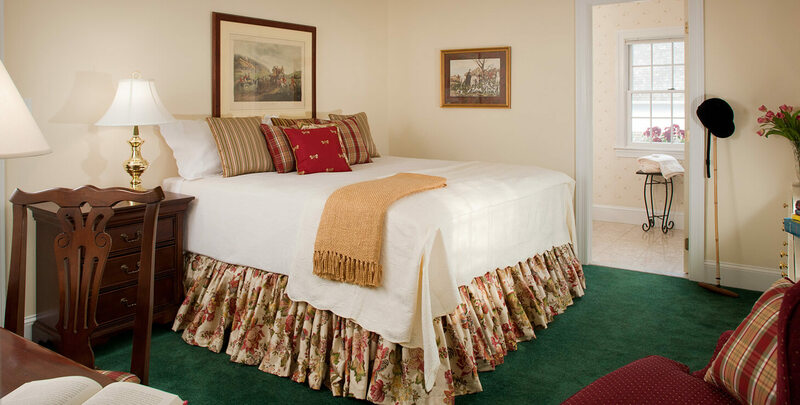 All guest rooms are separate from the farmhouse and have private entrances and bath. 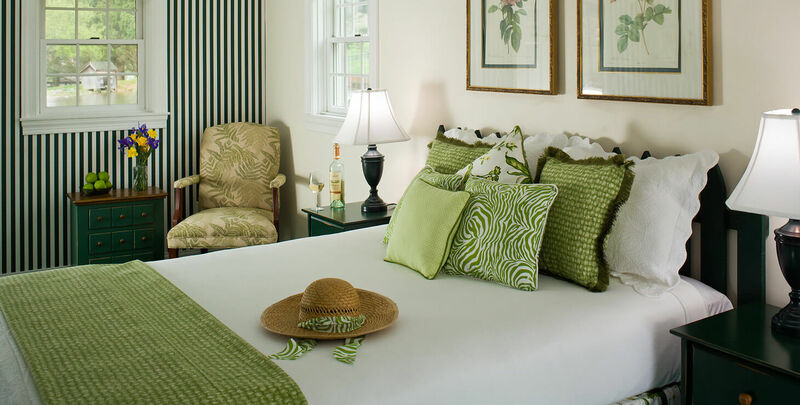 All rates are subject to 6% PA. sales tax & 5% local B&B tax, per room, per couple. All major credit cards, money orders, cash, company and personal checks accepted. To secure reservations a 50% deposit is required and the balance is collected upon arrival. No smoking is permitted indoors at Inn at Whitewing Farm. Smoking in a guest room by guest or friend of guest will impose a $250.00 cleaning fee. Smoking is permitted on the grounds, we take great pride in our landscape and would appreciate the disposal of smoking residue in the proper receptacles on the property. Any furnishings removed or damage other than normal wear and tear will be charged appropriately. Guest rooms and property are for registered guests only. For the comfort, convenience and respect of privacy and to ensure a quiet, quality stay for our guests, we ask that you do not bring in guests, friends or family that you are visiting in the area. 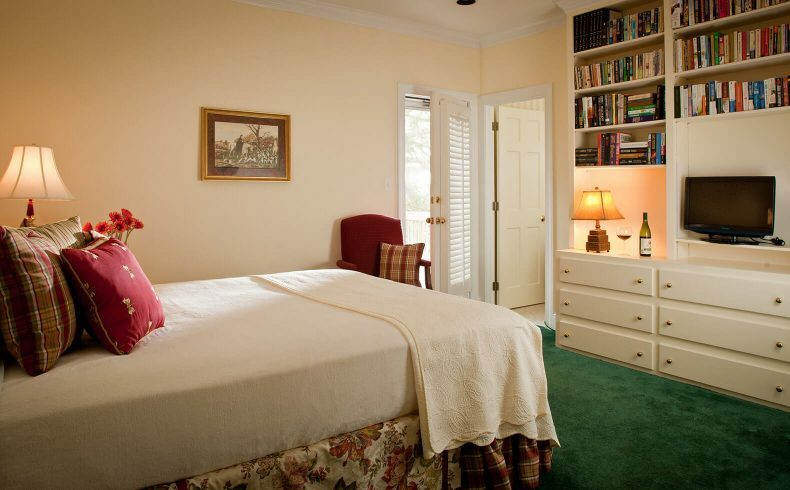 We are happy to pre-arrange a tour of the common areas of the Inn with advanced notice. For the safety of all guests as well to prevents unique odors from building up in guest rooms, we regret we cannot permit for guests to burn flame candles or incense of any kind. Pets: We regret that we are unable to accept pets. Cancellations aren’t really fun for anyone. We understand situations arise making cancellations unavoidable. However, last minute cancellations are difficult to fill as guests reserve stays far in advance. If your travel plans change and you must cancel your reservation, please call us at least 15 days prior to your arrival date to cancel and receive a refund* less a 10% processing fee (per room)* A 30 day cancellation notice is required on multiple room bookings, including family reunions, and for holidays and special events. In the unlikely event that you must cancel with less than fifteen (15) days* notice, shorten your stay or check out early, please understand that we must ask you to take responsibility for your reservation. If we can rebook your room(s), a full or partial refund may be made less applicable processing fees. Cancellations must be made over the phone at (610) 388-2013 directly with the Innkeeper, not in an email. Stop by the Brandywine Valley Chester County Conference & Visitors Bureau. 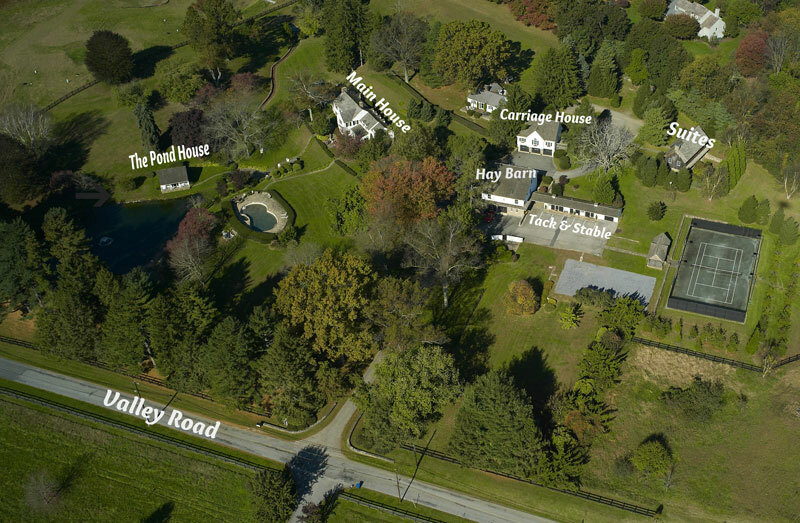 Located less than 2 miles away from the Inn, in front of the entrance to Longwood Gardens the center is staffed with trained and very knowledgeable employees that can give you a quick introduction to our area! Whitewing Farm warmly welcomes all guests. However, due to the historic significance of our 1700’s farmhouse and separate guest houses, the property is not wheelchair accessible. Removal of necessary physical barriers for accessibility is not readily achievable as such removal would threaten or destroy the historic significance of the property. 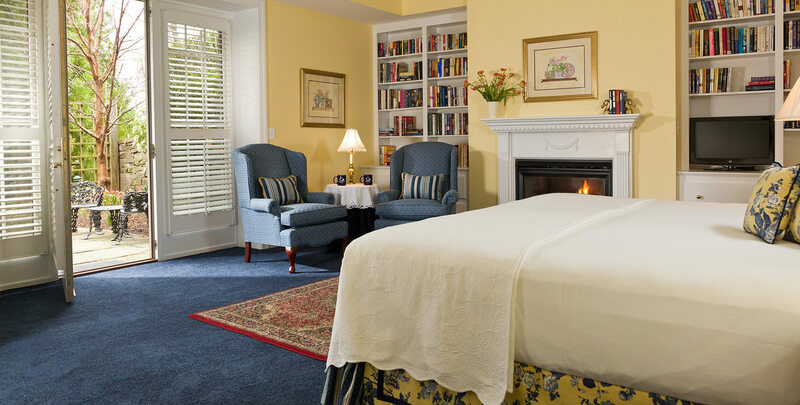 For special accommodation needs, please call us directly at (610) 388-2013 so we can help you determine the best guest room to ensure you have a comfortable arrival and enjoyable stay. We have identified and described inaccessible features in our bed and breakfast and guest rooms to allow individuals with disabilities to determine whether our property meets their needs. 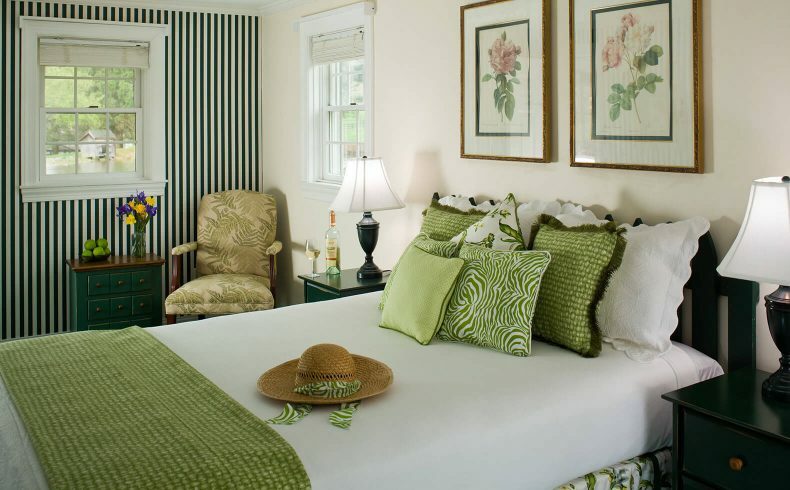 We guarantee that the specific guest rooms, once reserved, are held for the reserving customer. We make reasonable efforts with third-party reservation systems to make all rooms available through at least some of these services and provide these third-party services with information concerning the accessible features of the hotel and the rooms. We are committed to facilitating the accessibility and usability of this website for all people with disabilities. We will continue to implement the relevant portions of the World Wide Web Consortium’s Web Content Accessibility Guidelines 2.0 Level AA (WCAG 2.0 AA) or such other standards as required by the Americans with Disabilities Act (ADA). On a periodic basis, our website will be tested with assistive technology. Please be aware that our efforts are ongoing. You may email us at stay@innatwhitewingfarm.com or call us 24/7 with questions or concerns regarding ADA accessibility issues, including issues accessing the website.